The WMSAW14 series of AC/DC wall mount power supplies provides up to 15 Watts of output power. This series has single output models with an input voltage range of 90~264VAC. These supplies are protected against over voltage, over current, and short circuit conditions. The WMSAW14 series is RoHS, REACH, and Efficiency Level VI compliant and has 60950/60335/61558/60065 safety approvals. 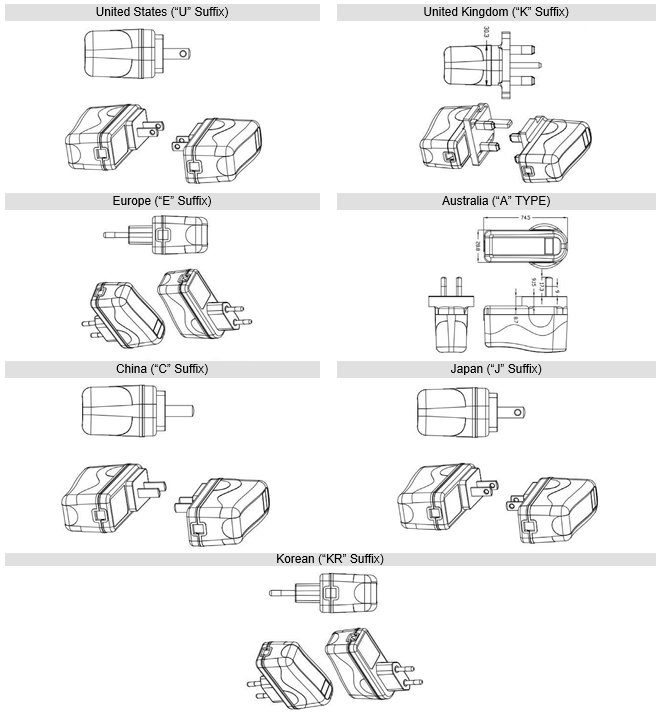 United States, United Kingdom, Europe, China, Australia, Korea, and Japan AC plug types are available for this series. Several output connector options are also available. Please contact the factory for ordering details. Notes: 1. The “x” in the model number represents the type of plug: “U” for United States type, “K” for United Kingdom type, “E” for Europe type, “A” for Australia type, “C” for China type, "KR" for Korean Plug and “J” for Japan type. 3. Several output connector options are available. Please call factory for ordering details.